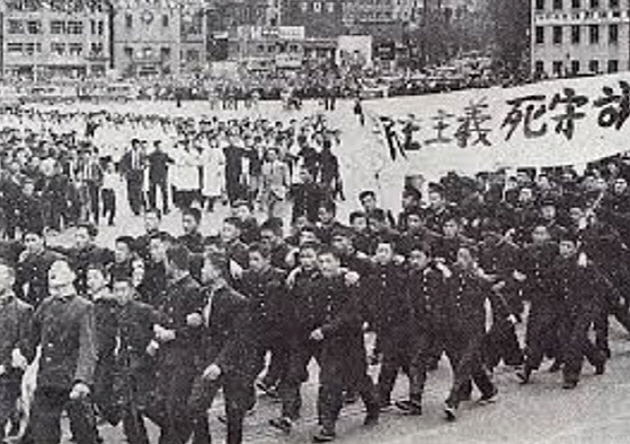 The April 19 Revolution (or April 19th Uprising) in 1960 is regarded as one of the two most important popular movements in Korean history along with the March 1 Independence Movement in 1919. The March 1 Independence Movement was the largest independence movement against Japanese colonial occupation and led to the establishment of the Provisional Government of the Republic of Korea. 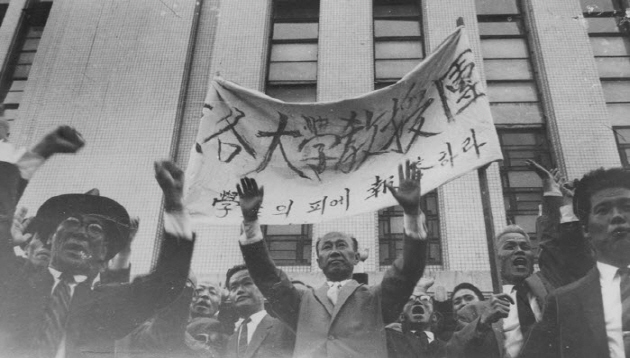 The April 19 Revolution was the first democratic movement that overthrew the First Republic of Korea led by RHEE Syngman. The April 19 Revolution began on SNU campus. At 8:50 AM of April 19, an SNU student of College of Liberal Arts and Sciences posted a hand-written manifesto in front of the college building. 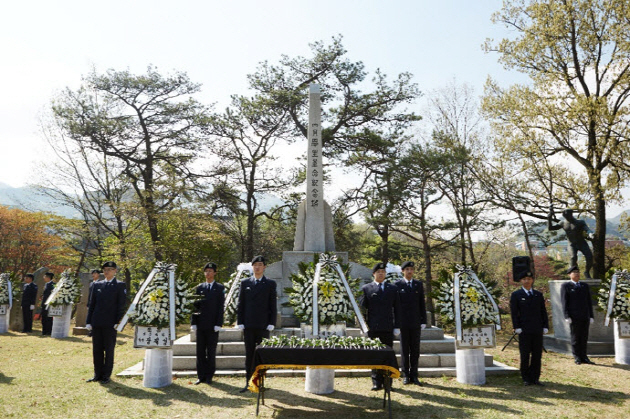 The message of the manifesto was so powerful that students around the campus who read it instantly took to the street filled with martyrship, soon followed by 3,000 citizens of Seoul. Police started shooting four hours after the manifesto, and six SNU students were killed by police. Six days later, SNU professors gathered at the faculty club along with other universities’ faculty members and wrote another manifesto and marched to the National Assembly Building, which completed the revolution initiated by students. SNU created a monument on campus to remember this historic event, engraving the students’ manifesto on the face of it. The Tower of April 19 Revolution was unveiled in 1961 and soon became the symbol of SNU along with the Marronnier trees and the Clock Tower. SNU moved the Tower when relocated its campus to Gwanak in 1975. 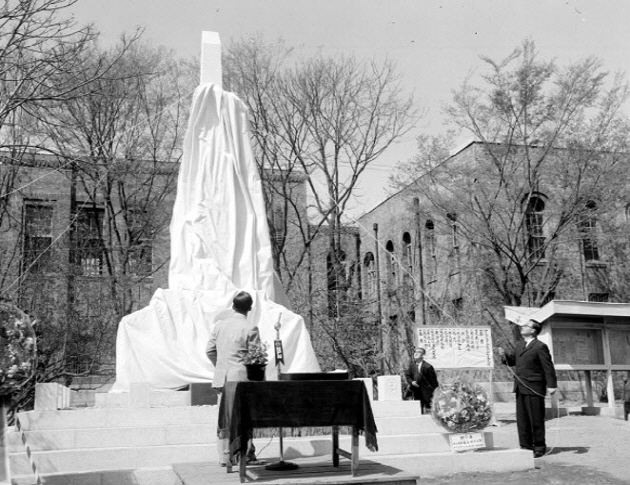 The Tower of April 19 Revolution unveiled at the old campus of SNU on April 19, 1961. We, who have stormed down from the ivory tower of Truth, armed with the spirit of academia, throw ourselves into the turbulence and confusion of history in order to sow the seeds of Reason and Truth in the depleted, barren soil of reality. We are summoned today, by the solemn command of our conscience, to condemn wickedness and cruelty and to respond with our individual senses of duty, with honor and clarity. What we know is that these dark, recent paths have resulted from a brute, totalitarian abuse of authority that disguises itself as democracy and freedom. But history has shown us that, in the struggle for democratic freedom, despotism is no more formidable an opponent than a tiger made of paper – a mere pretense of power. As a young university body, we consider it the highest honor to lead our struggle against the communist regime. Though the university is but recent in Korea’s history, we are proud to lead the fight against the imposters, who offer only the façade of democracy. This battle against this communist regime is indeed a battle against false democracy. The foundation of modern democracy is Freedom. Reason gives us insight into the fact that Freedom is not just slipping away from us, but it is being taken away – forcefully and thoroughly, by its very roots. The battlefield of Freedom has now been set ablaze. This whole field – which justly belongs to the people – is now in the process of being reclaimed -- and it will be reclaimed by the generations to come. These corrupt systems and their bureaucracies – which should have been serving the democratic People – have shed their patronizing masks of false democracy and revealed themselves to be puppets of authority. The public interest – the most basic concept of democracy – has been monopolized by evil forces. The media, the press, the assemblies, and the various groups within which the thread-like flame of freedom still flickered, have now been snuffed out completely by vicious powers. And pitch-black night has followed. Just look as Kim Ju-yeol’s gruesome death! His dead body is naked proof of the totalitarian state’s abuse of power, stripped to the core. Look how despicably they treat us, with violence and threats. No matter how much we have yielded to them, we feel the humanitarian conscience within us, urging us to cry out, to fight back. Behold! Brimming with joy, we raise the torch of Freedom! Behold! In the dark and silent night, we proudly strike the bell of Freedom! Alongside our fathers and brothers, who fought for and celebrated Freedom at the end of Japanese rule, we feel no embarrassment. We feel no loneliness. We feel only honor – to be the eternal defenders of democracy. Behold! Even those in the gutters, who brood in self-torture at their cowardice, crawl out and follow us! Let us go forth! The key to Freedom is courage. Our body is one made of the passionate, ardent love for Freedom. Justice is on our side.